The original MGB suspension relies on the leaf springs to provide lateral location. I am replacing my leaf springs with a coil over dampers so needed to use either a Watts Linkage or Panhard Rod for lateral location. 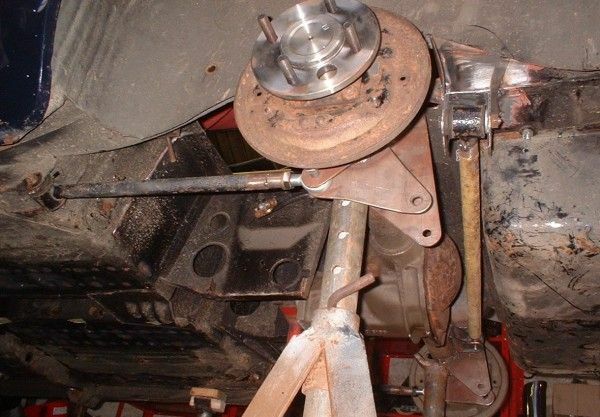 A Watts Linkage is more effective, but involves a lot more welding and takes up more space than a Panhard Rod. I went for the Panhard Rod. There was not a lot of clearance between my SD1 back axle and the fuel tank, and I was keen to mount the Panhard Rod outboard of the coil spring in the hope of finding some chassis to weld to. The only way to fit my Panhard Rod was to angle the rod forwards from the body to the chassis. I was able to make the rod about 33 inches in length. The rod moves in an arc, so the axle will move nearly 1/4 inch sideways on full bump or rebound. Angling the rod forwards has the advantage of bringing the axle connection closer to the axle. I incorporated the mounting into my spring and upper arm mountings. The Panhard Rod shown in the picture is a mock up made from an old piece of tube. 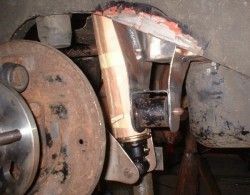 The sperical bearing will be used in the final Panhard Rod, but the tube will be replaced. This photograph shows the body mounting under construction. The forward mounting is actually an extension of the upper damper mounting and is welded to the chassis and the front of the boot floor. The rear mounting also mounts to the chassis and boot floor. Between the two mountings I have added a U shaped bracket to double the thickness where the Panhard Rod attaches, and to add some stiffness. I plan to box in the front and rear faces of the bracket to add further stiffness, and I will probably also strengthen the boot floor where the bracket attaches. 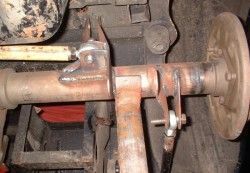 The completed Panhard Rod mounting photographed from below. Ths photograph shows how the mounting is integrated into the damper tower. 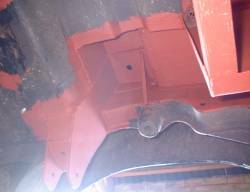 I have added a drain hole to the underside of the Panhard Rod mounting in case any moisture is trapped within the box section. You should take roll centres into account when fitting a Panhard Rod to any car. If the rear roll centre is too high then the rear of the car will not roll enough resulting in oversteer. If the rear roll centre is too low you could have understeer. Panhard Rods make roll centre calculation easy - the height of the Panhard Rod is the height of roll centre. I have mounted mine on the centre line of the axle to aid packaging. It may have been bettre to mount the rod a little lower, but it would probably be a bad idea to mount it any higher. It should be possible to use a similar Panhard Rod on leaf spring cars. You will probably have a lot more space behind the axle so could make the Panhard Rod longer.